I always loved the look of John Lennon's Rickenbacker 325, and really liked the '67 4005 Ric that I owned for 25 years. 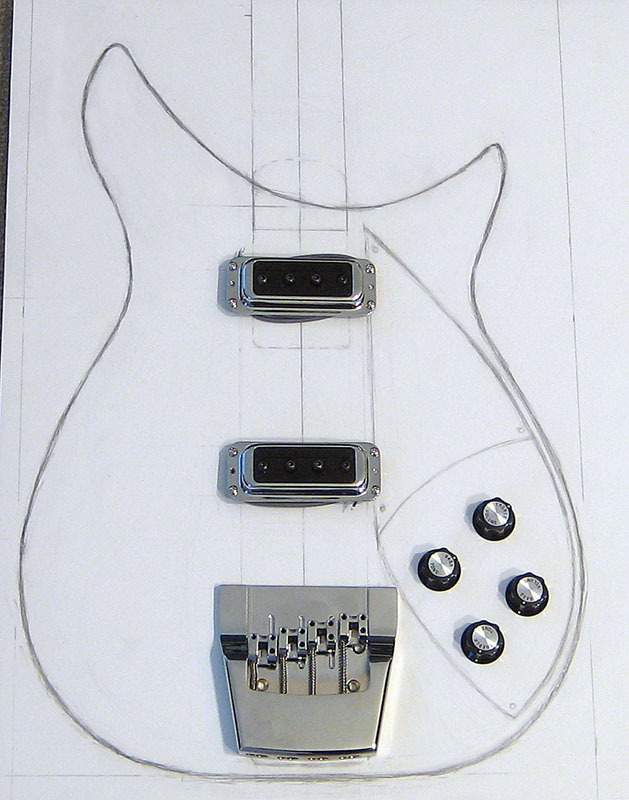 To me, the 4005 was a great bass, but if I had one complaint, it was a little big and bulky for me, so I've decided to undertake building what I think an ideal version of a Rickenbacker type semi-hollow bass would be. 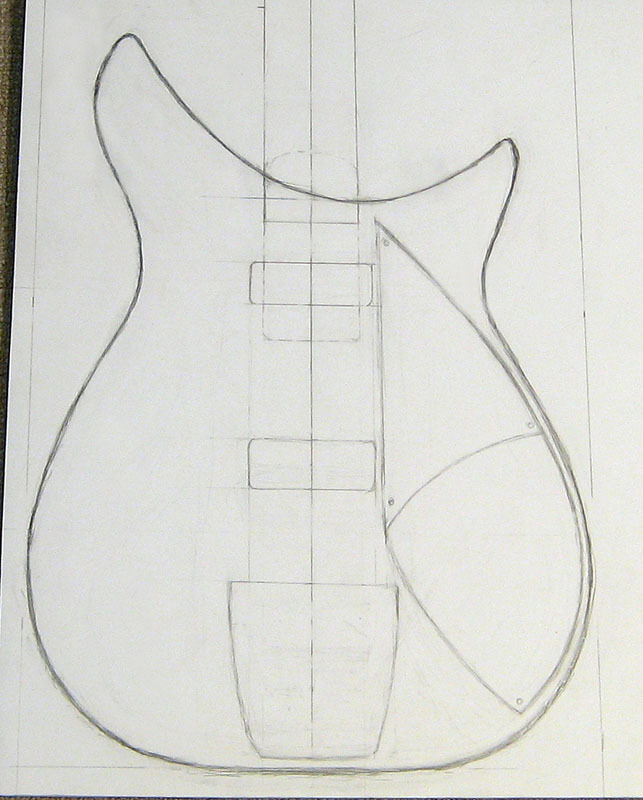 It is going to have a 33.25" scale dot/bound set neck, with two Rickenbacker hi-gain pickups in the 4003 bass positions.. 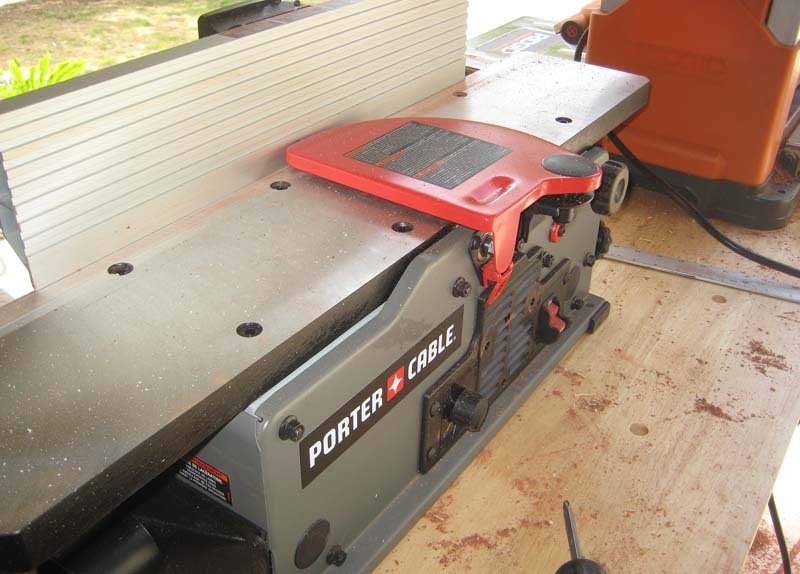 It will be hollowed out from the back with a two piece 1/4" back maple cap. 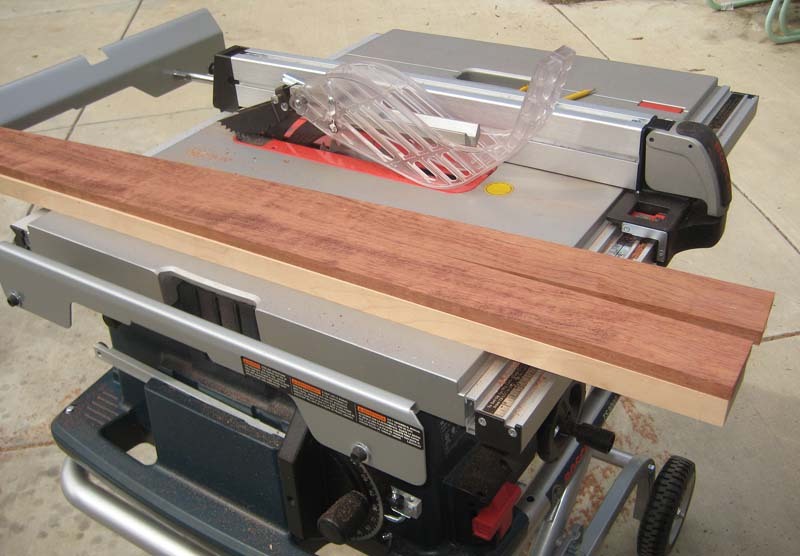 I just got all of the wood and parts together for the first two and am currently in the process of gluing up the wood to get the first one ready for cutting. 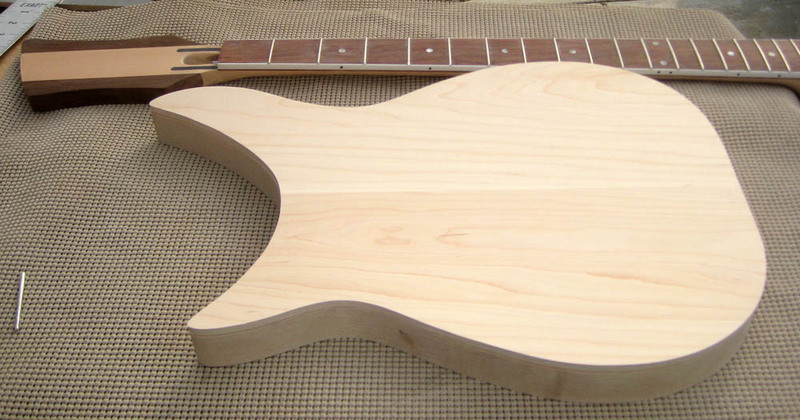 I want it to retain a Rickenbacker's tone, so I'm using hard maple for the body and neck with a Bubinga fingerboard. 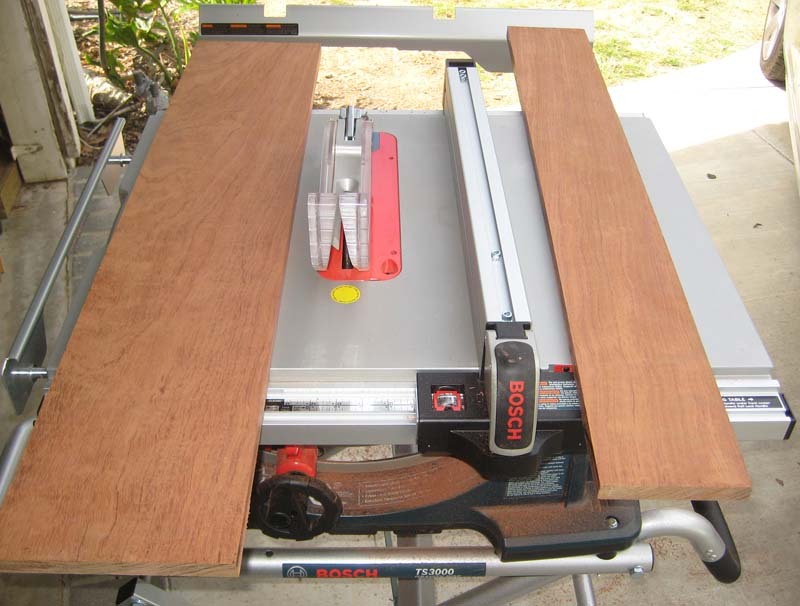 To make it a bit more comfortable than a 'flat-backed Ric, I'm also going to incorporate a tummy cut. 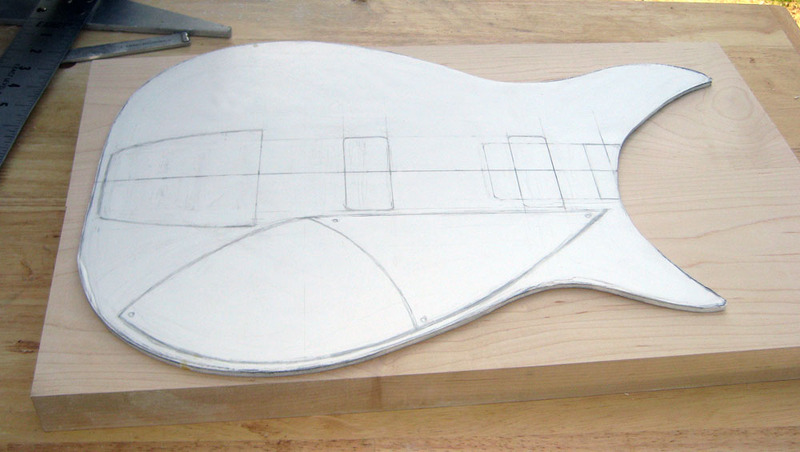 To keep it's size manageable, I intend to make it no more than 13" wide at the lower bout, so it took a little 'massaging' of the guitar version's outline to get it to still retain it's look while enabling it to have a 33.25" scale. Lennon's 325 was a full 2" thick, but I'm going to make mine 1 5/8" thick to save weight and not feel so bulky when played on a strap. I guess it's a sign of my being 'old school" but I never use a computer to draw out my bass designs, so the first thing that I did was to draw out the rough body shape, in actual size, on a piece of foam sandwiched poster board. 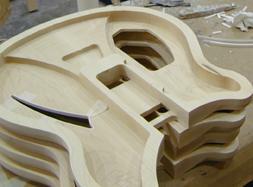 Here's a pic of a Rickenbacker 360 that shows how it is hollowed out from the rear. 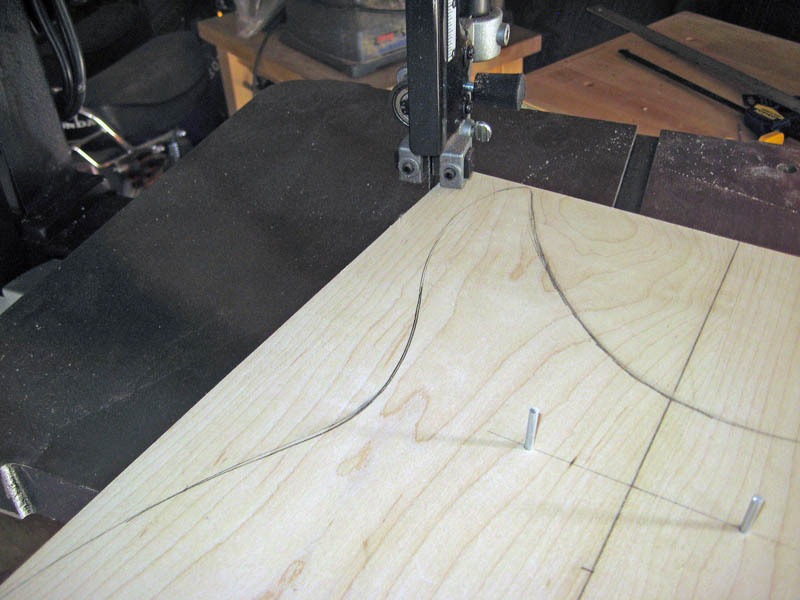 This is the same basic construction method that I am using for this bass build, only I will not be cutting a 'shark fin' F hole in mine. 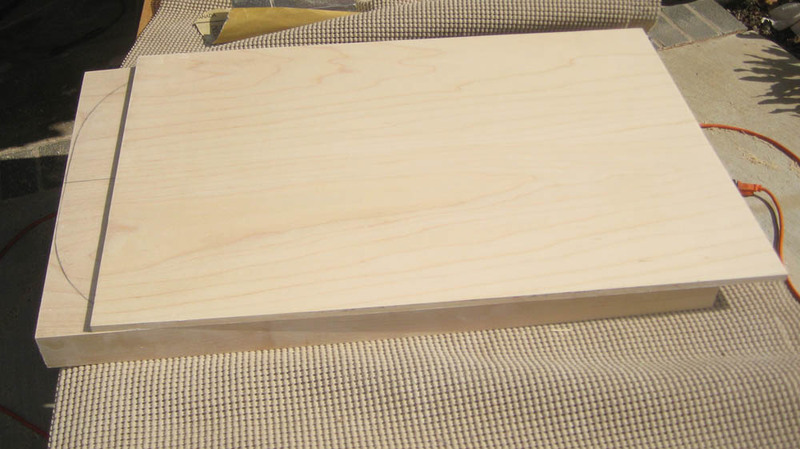 Here's a pic of two of the quarter sawn maple neck blanks, with the their truss rods and fingerboard blanks. 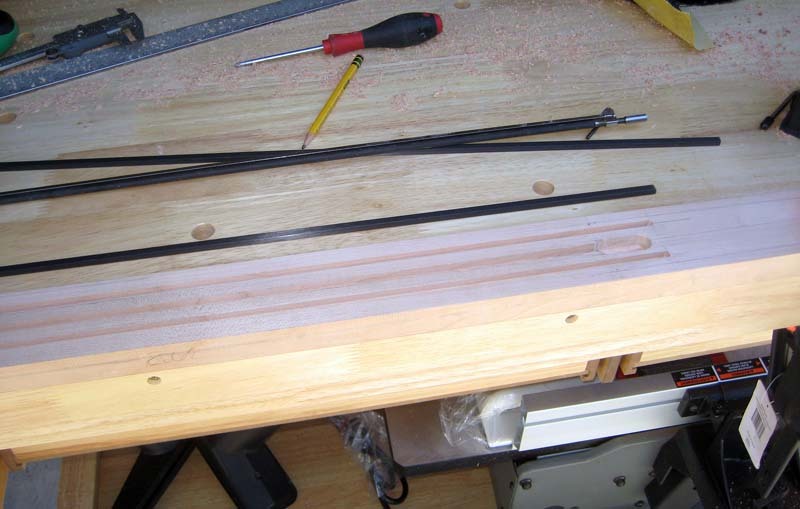 I'll also be installing two carbon/graphite stiffening rods on each side of the truss rod to give them more rigidity and minimize and dead spots while keeping its weight as light as possible. This page will be constantly updated as the work progresses. 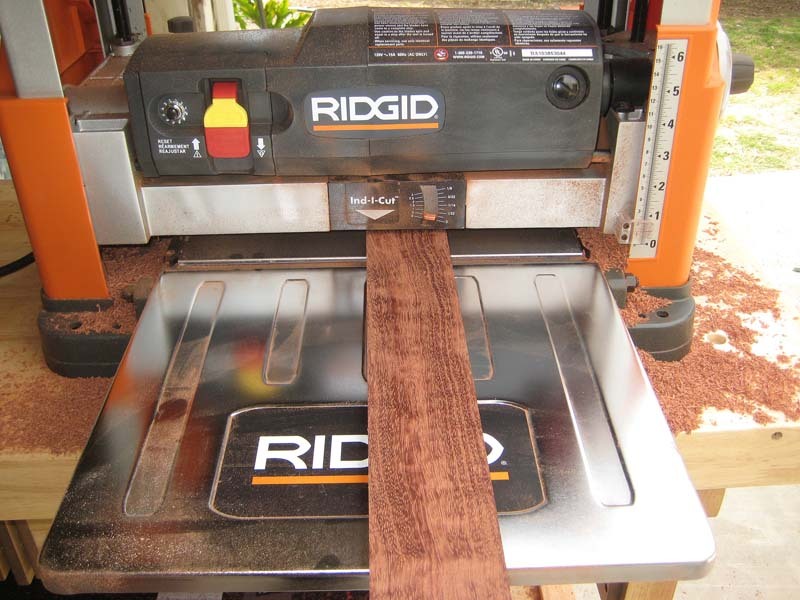 I'm currently 're-setting' up my shop since I just bought a new bandsaw, table saw, two routers, a planer, a jointer and an additional oscillating drum sander. 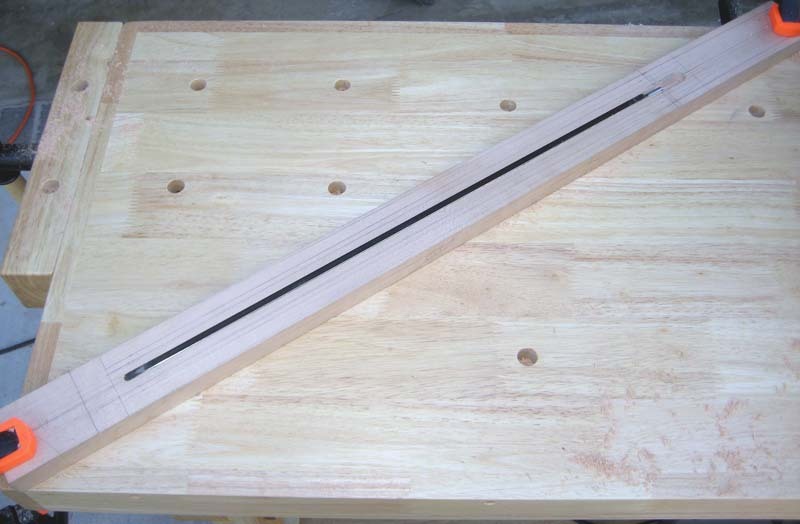 I'm also wating for a couple of specialized router bits for this bass to arrive that should be heare by the end of this week, so stay tuned. Here's the last pic until tomorrow. 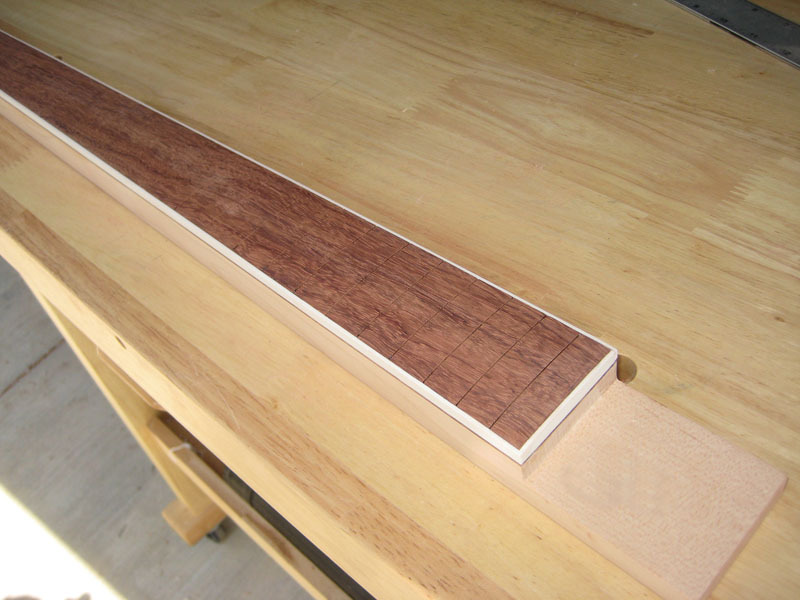 I hope to have the binding shelf routed, binding installed, the walnut 'wings glued onto the headstock (and shape it), install the front dot inlays and side dots, radius the fingerboard, fret and get it's rear profile roughed in by the end of the day. 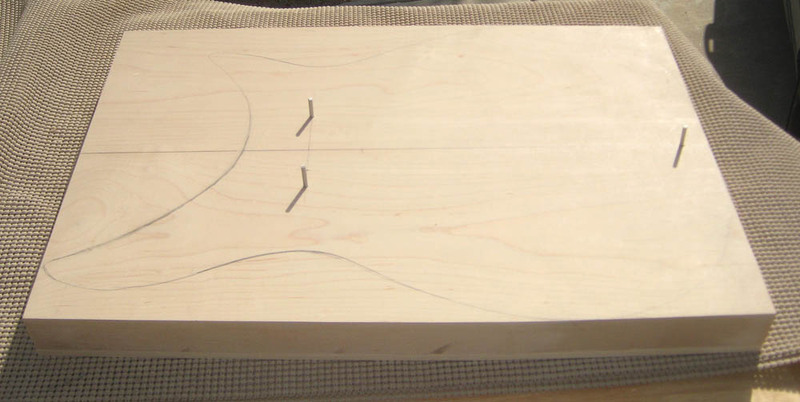 Here's a pic of it after routing the binding slot, installing the binding and radiusing the fingerboard with a 10" radius. 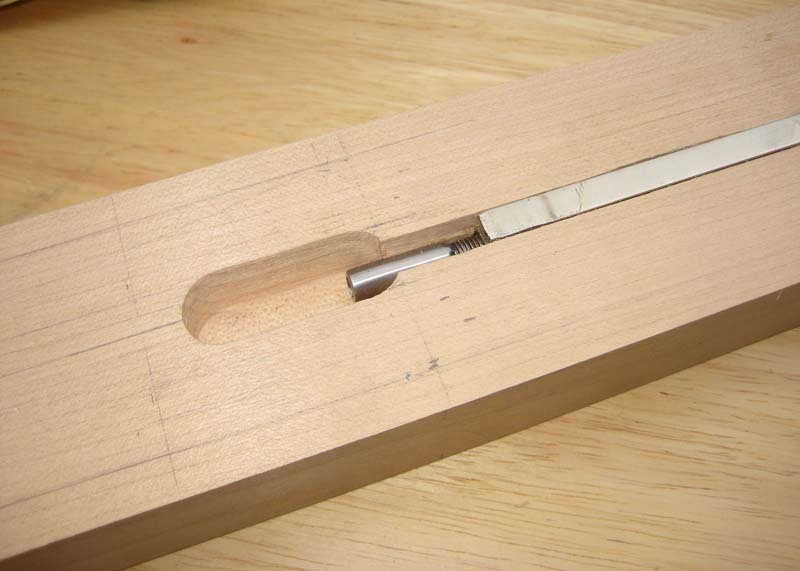 I also cut the tenon where the neck is going to be glued into the body. I still need to final shape the neck, install the side dot markers and bore 1/2" holes for the tuning keys, but that shouldn't take much time. 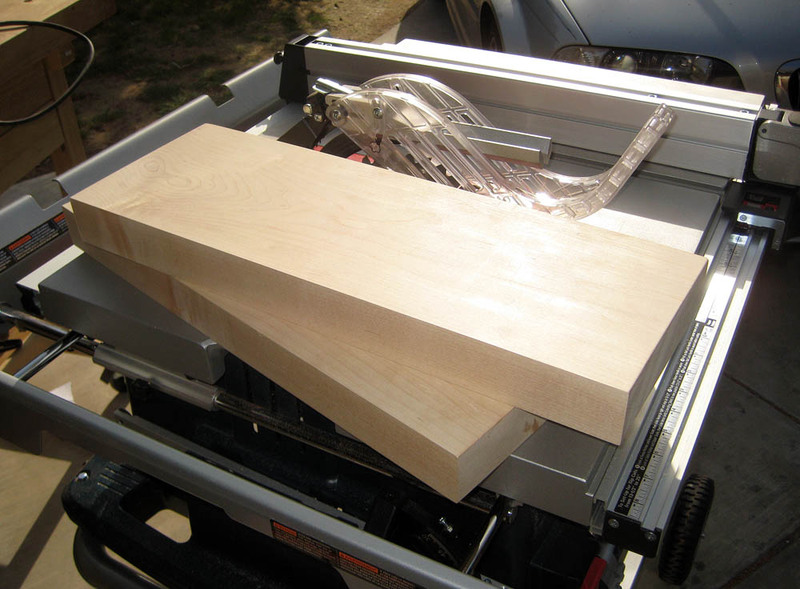 Hopefully, I can start building the body for it tomorrow and and have it close to completed by friday. After feeling this neck, I really want to play it now! 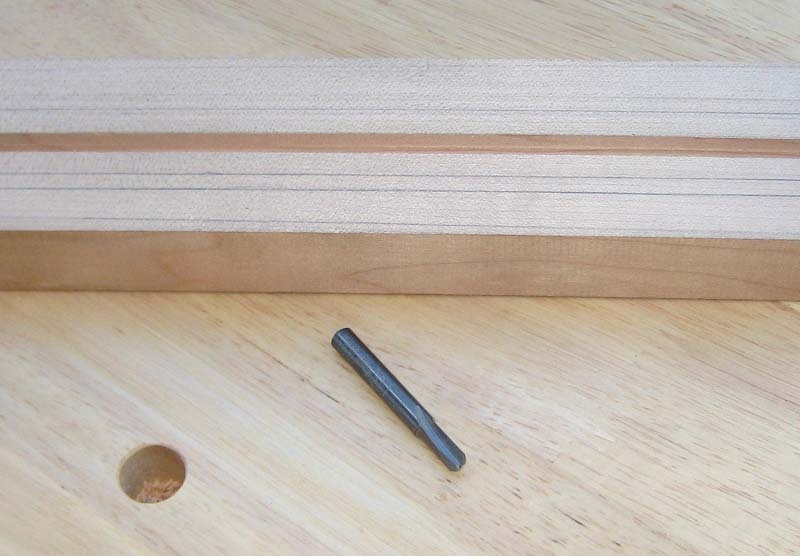 I added a piece of maple to the heel of the neck to build it up to 1.00". 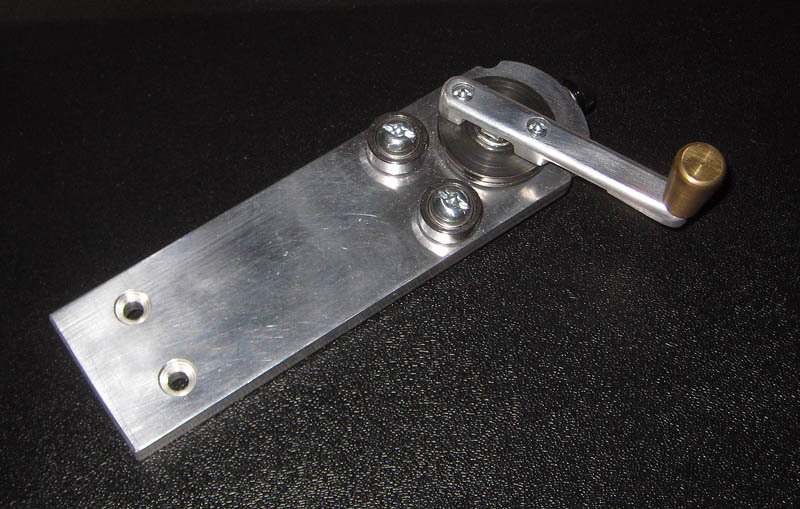 I used my drill press to drill three 1/8" indexing holes, and used aluminum pins to keep the two pieces aligned so i can cut them out and shape them together. 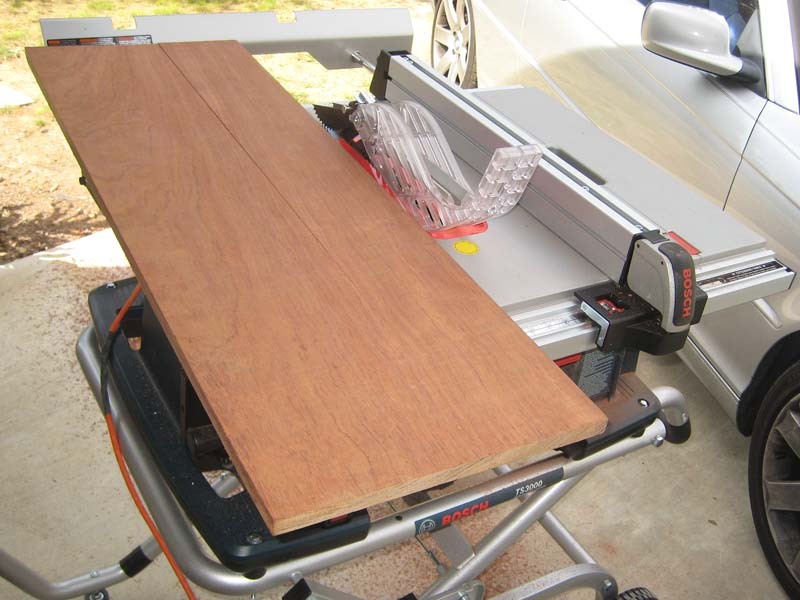 They'll also allow me to keep everything in place when it gets glued up. (one is under the bridge and the other two are under the neck pickup). They do not go all the way thru the back, and once it's all glued up, the aluminum pins will be removed and filled with 1/8" wood dowelling. 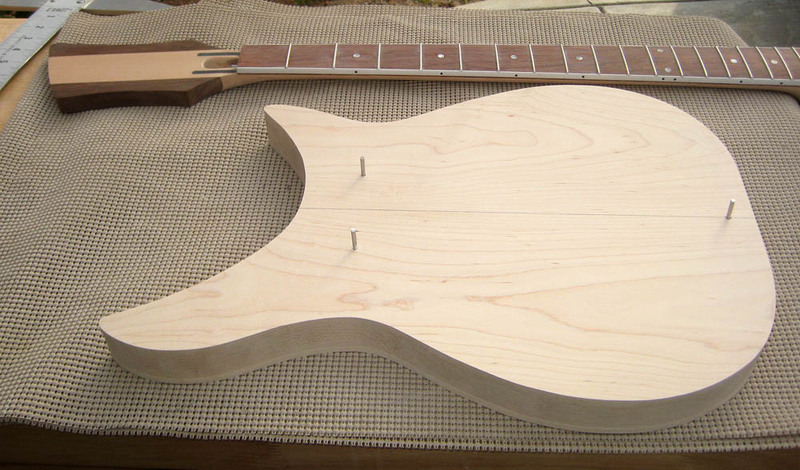 I have a gig tomorrow so I won't be able to continue working on it until Sunday Next, I'll have to cut the tummy cut, route the area for the neck, pickups and controls and route the 'wings' area of the body to make it semi hollow. The center is going to be left solid all the way from the neck pocket to the bridge. 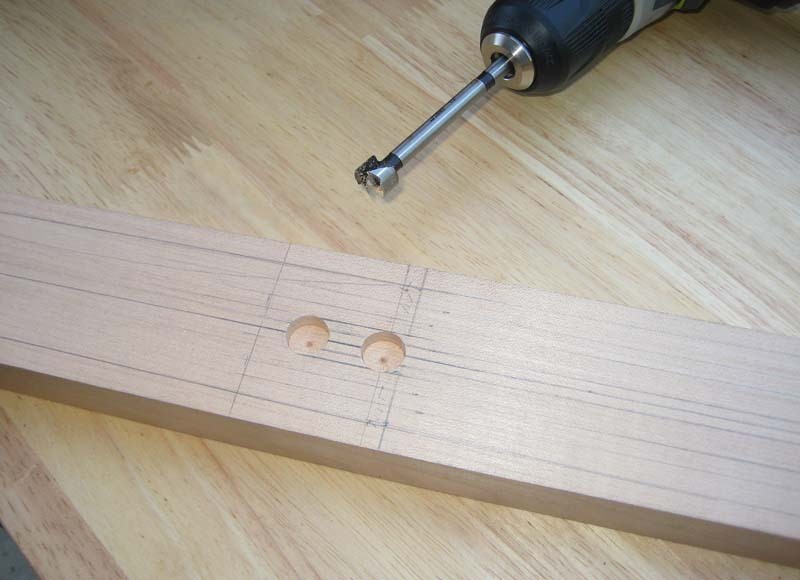 BTW, the completed neck assembly weighs 1lb 12oz, so it weighs about the same as a standard fender precision neck. Coupled with the body ( I estimate the body to weigh about 5 lbs) and the rest of the hardware, it looks like I may hit my target all up weight of 8- 8 1/2lbs after all. 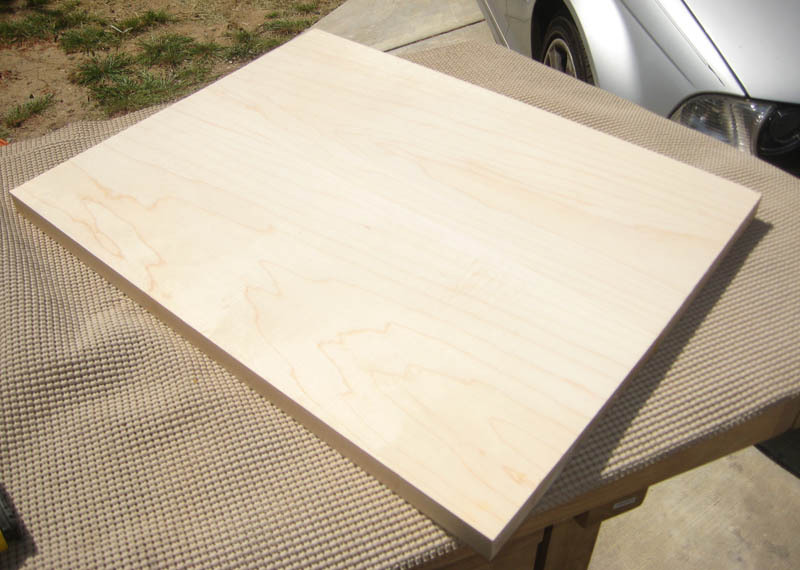 I know that it may seem to be a shame to cover up all the pretty maple and walnut, but this one is going to be painted with black nitro and have a white plexi pickguard. I do have all the wood and components for a second one (I seem to always build two of everything) and the second one is going to be finished in maplglo (natural). 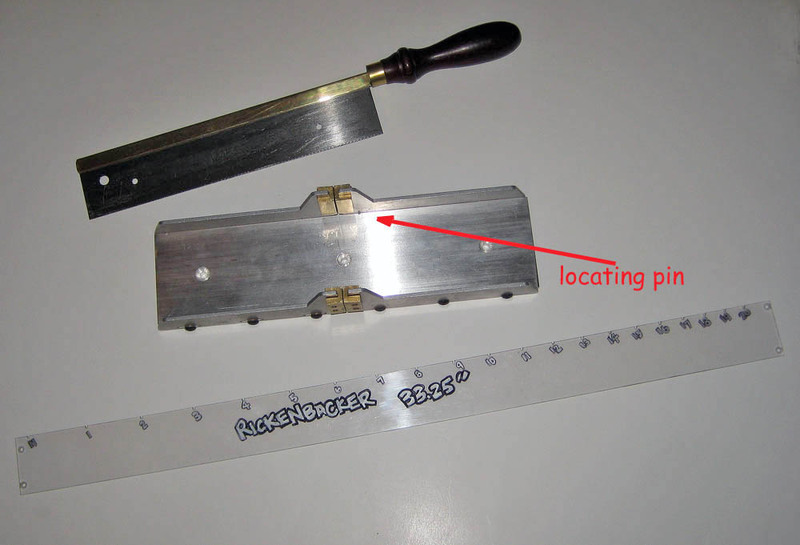 To make it a little easier (and foolproof), I made my own Rickenbacker bass fret spacing jig out of lexan. 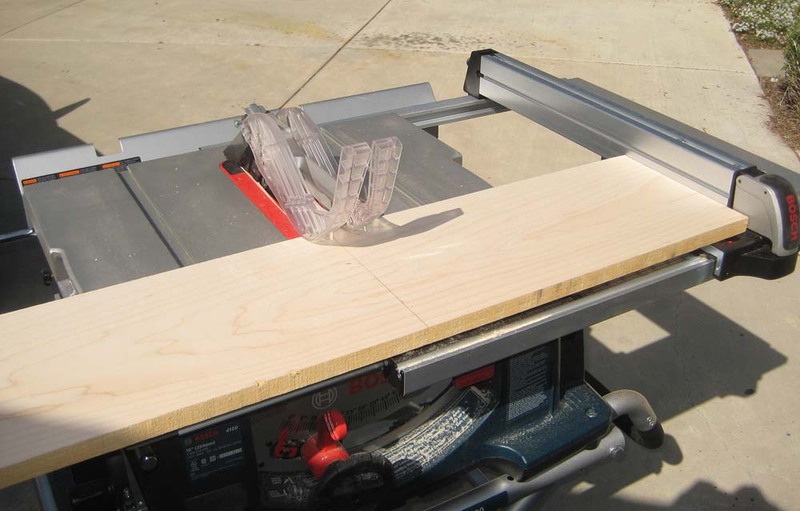 You simply screw it to the underside of the fingerboard blank, and set the locating notch in the miter box's locating pin, cut the slot, and move onto the next one until you've cut all 20 of them. 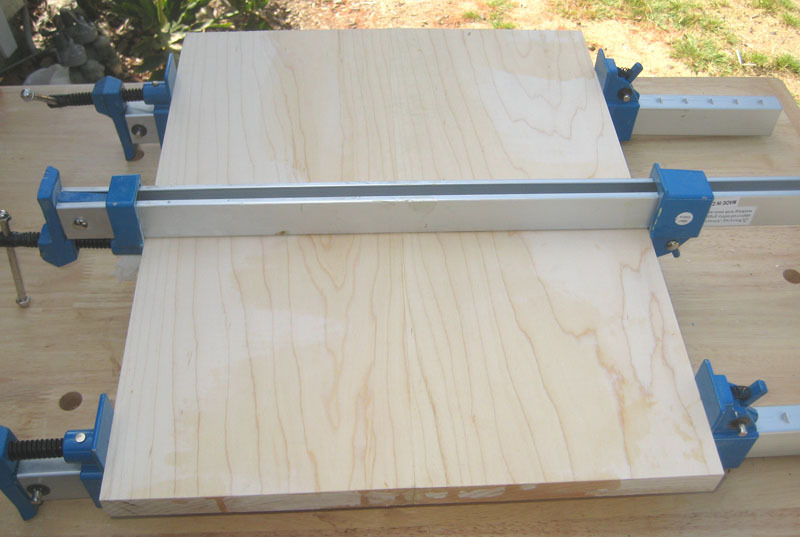 Once they're cut, you cut off the board at the nut and at the end of the fingerboard where the 4 mounting screws held it in place. 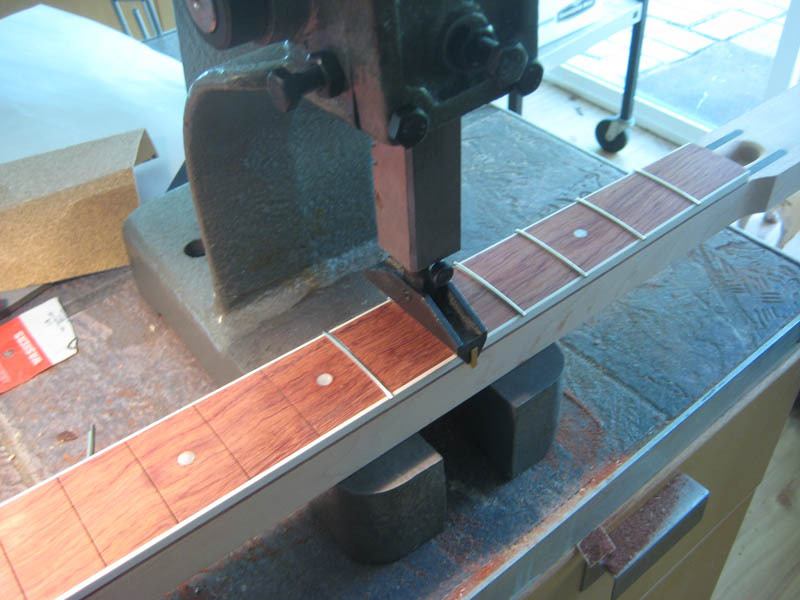 This really made cutting the fret slots super easy.